The Florida House of Representatives has proposed a bill that would result in a consolidation of the current USF System. This appears in statute 1004.335. If the bill is passed containing statute 1004.335 by the state legislature and signed into law by the governor, our institutions in Tampa, St. Petersburg and Sarasota-Manatee would be statutorily required to operate under a single, unified accreditation. Employees working for the university are restricted as to what they can do/say regarding their opinions on this bill because it can jeopardize their jobs. This is why it is even more important that students and alumni express their concerns. Let’s continue USFSP’s legacy as a separately accredited university! 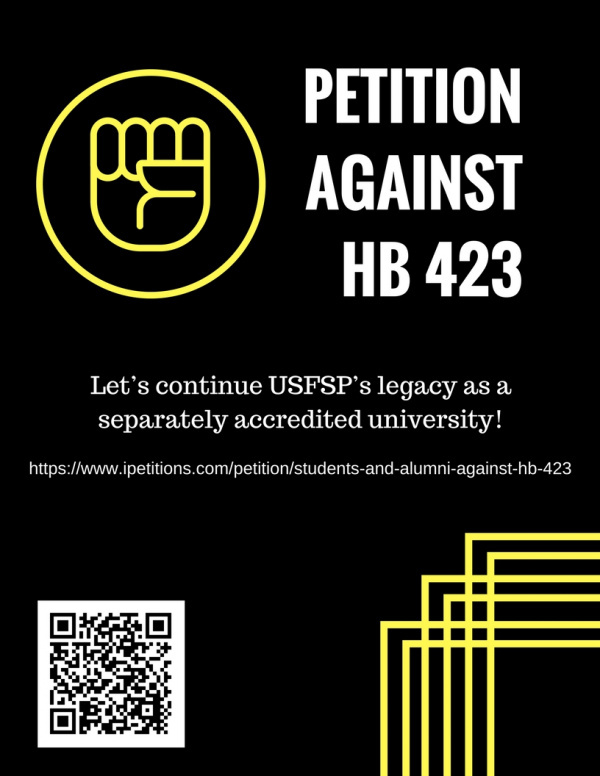 We, the undersigned, are concerned students who urge our leaders to act now to vote against HB 423.